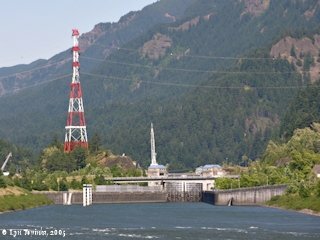 "Bradford Island, Cascade Island, and Robins Island"
The Bonneville Dam is a hydroelectric dam completed in 1938 and located on the Columbia River at River Mile (RM) 146. The dam complex is built across three islands - Bradford, Robins, and Cascade. 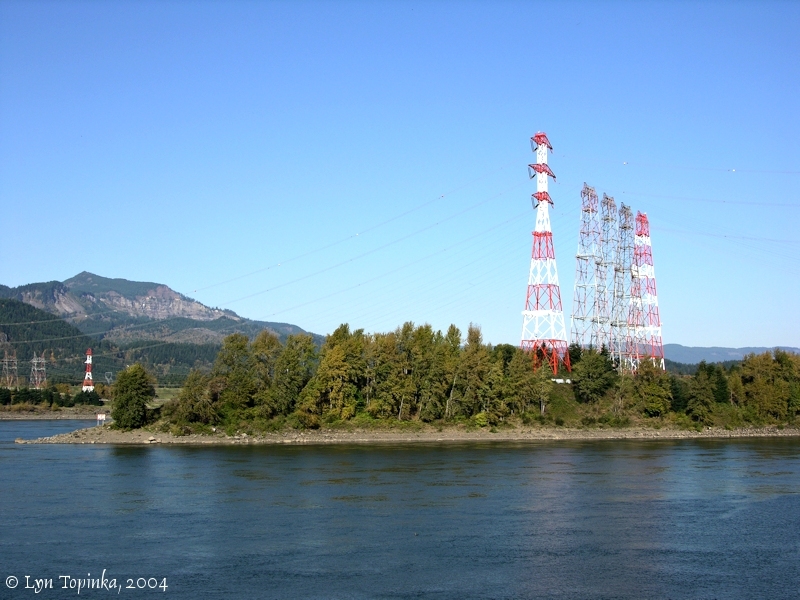 When dam construction began the Columbia River was split only by Bradford Island. As the dam went in the Spillway Dam was built between the Washington shore and the north side of Bradford Island; the powerhouse was built between the south side of Bradford Island and the north side of a newly created island named "Robins Island"; and the locks were built on the south side of Robins Island and the Oregon shore. In 1982 a second powerhouse, called the "North Powerhouse", was built. 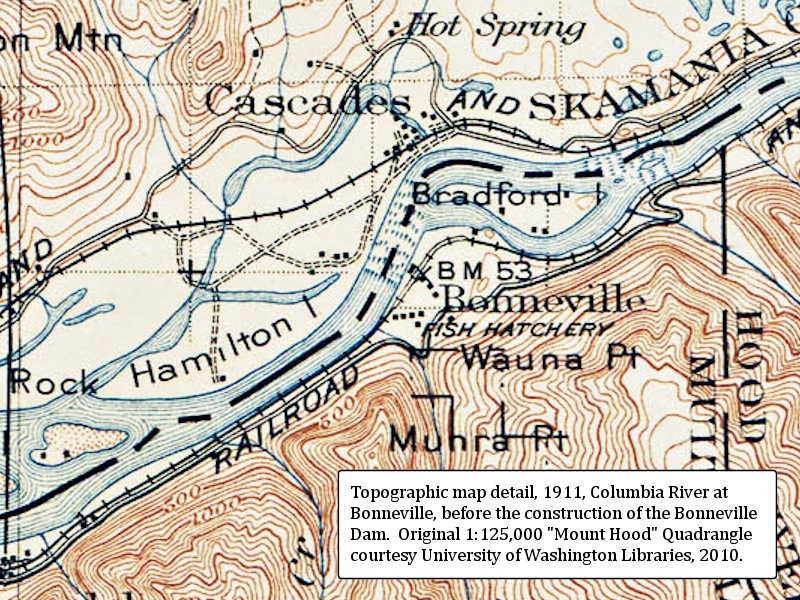 The Columbia River was re-routed and Cascade Island was created, with the North Powerhouse being built between the north side of Cascade Island and the Washington shore. The Spillway Dam was now anchored on the south shore of Cascade Island. 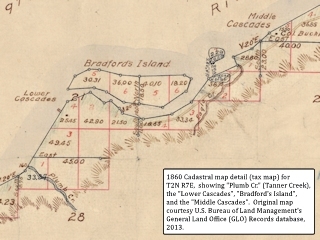 Click image to enlarge 1860, Cadastral Survey map detail (tax survey) for T2N R7E, showing "Brandford's Island". Original Cadastral Map courtesy U.S. Bureau of Land Management's General Land Office (GLO) Records Database, 2013. 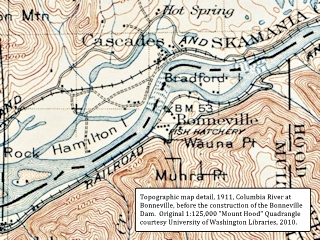 Click image to enlarge 1911, Topographic map detail, Columbia River at Bonneville, before construction of the Bonneville Dam. Original 1:125,000 "Mount Hood" Topographic Map courtesy University of Washington Libraries, 2010. Lewis and Clark called the Bradford Island "Brant Island", although Patrick Gass erroneously called the island "Strawberry Island" in his journal, an error which was perpetuated by many subsequent writers. Just downstream of Bradford Island is Hamilton Island, the true "Strawberry Island" of Lewis and Clark. 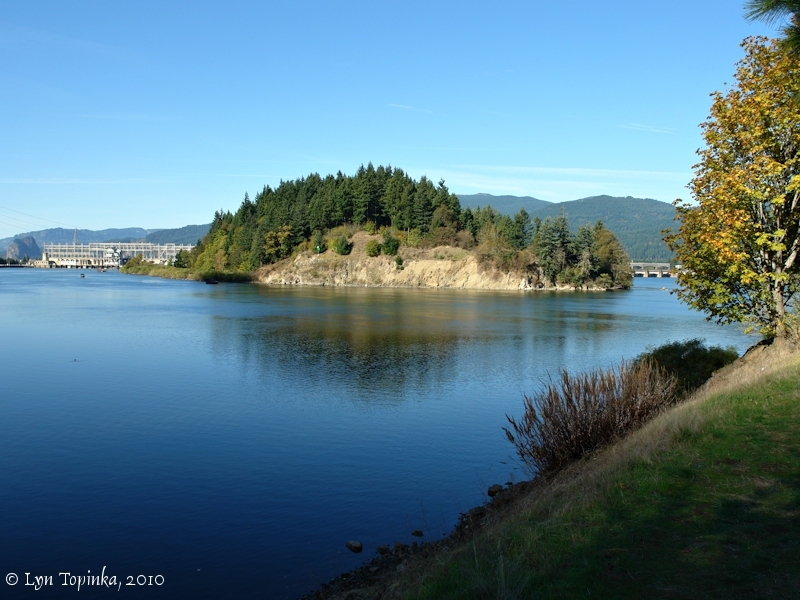 On April 9, 1806, Lewis and Clark camped near Tanner Creek, on the Oregon shore opposite Bradford Island. 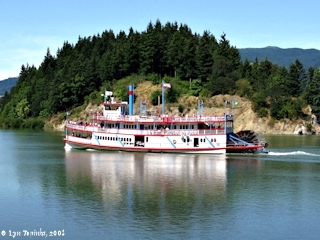 A good view of the downstream end of Bradford Island can be had from the shore of Hamilton Island, and a a good view of the upstream end of Bradford Island can be had from the mouth of Eagle Creek on the Oregon side. Click image to enlarge Bradford Island. Bradford Island is one of three islands crossed by the Bonneville Dam. Greenleaf Peak is in the background. Image taken October 27, 2004. Click image to enlarge Bradford Island, downstream tip, as seen from Hamilton Island. Image taken August 1, 2004. Click image to enlarge Bradford Island as seen from the mouth of Eagle Creek, Oregon. The high point of Bradford Island use to be called "Bonny Rock" locally. The South (original) Powerhouse can be seen on the left and the Spillway Dam can be seen on the right. Image taken October 18, 2010. 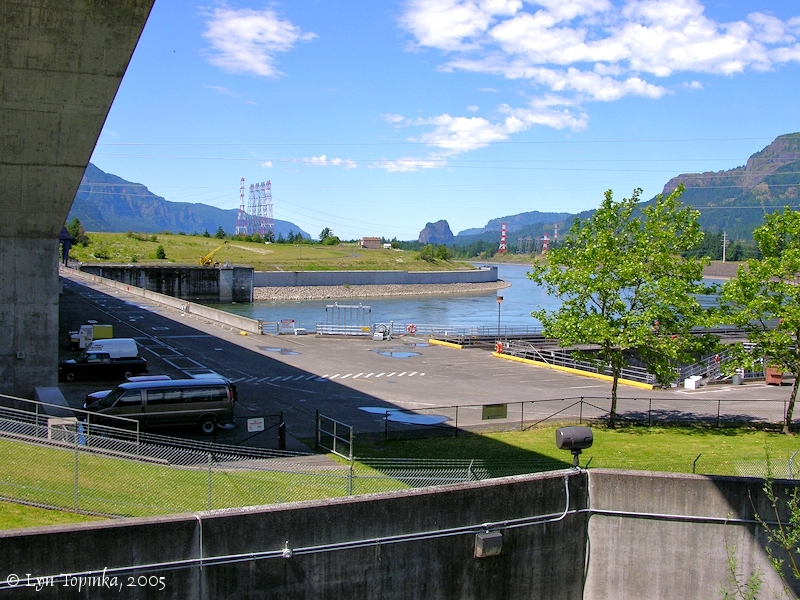 Robins Island was built during the initial construction of the Bonneville Dam, and was named after the chief engineer in charge of the construction, Colonel Thomas M. Robins. 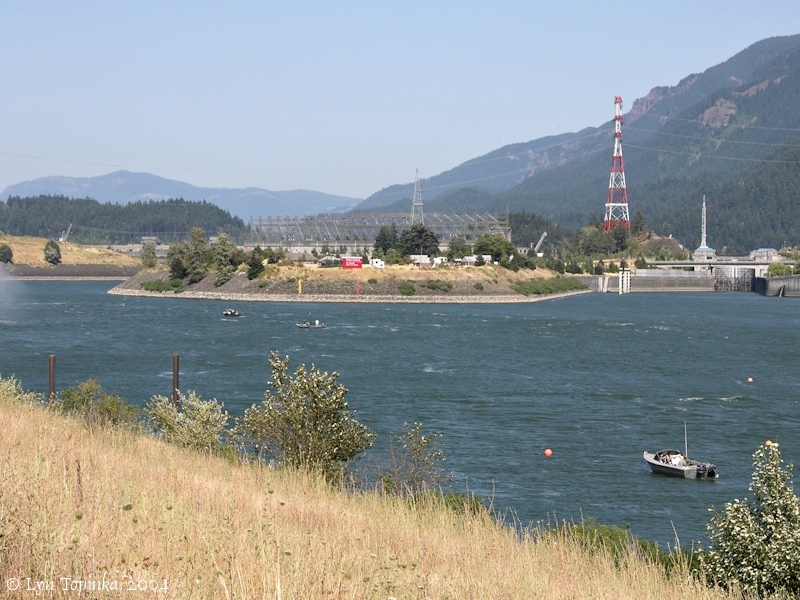 Robins Island is located slightly downstream of Bradford and Cascade Islands at Columbia River Mile (RM) 145. 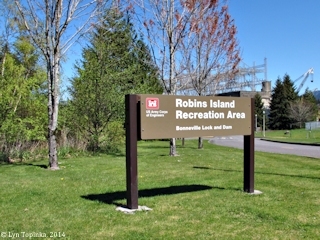 The U.S. Board of Geographic Names made the name "Robins Island" official in 1974. The first powerhouse lies on the north side of Robins Island. The original Bonneville Locks lie on the north side of Robins Island while the new Bonneville Locks lie on the south side. 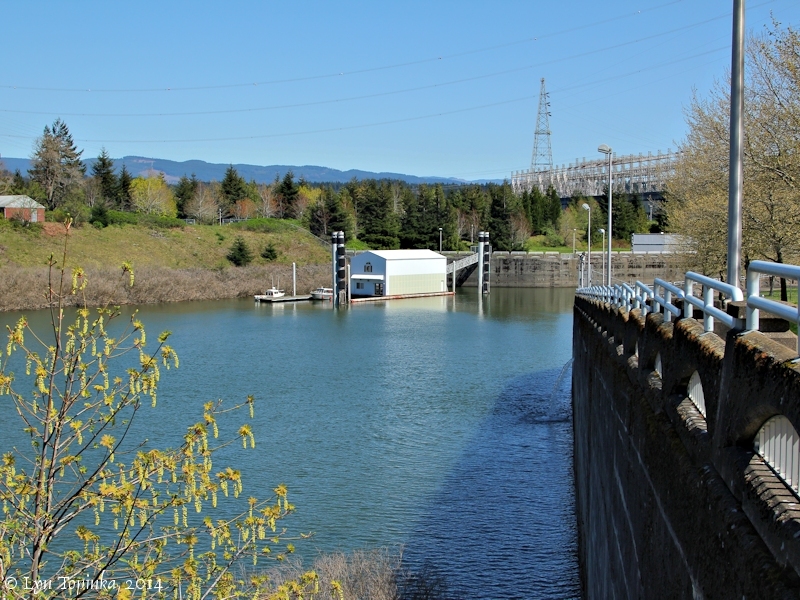 Click image to enlarge New Bonneville Locks, downstream end, as seen from Hamilton Island. 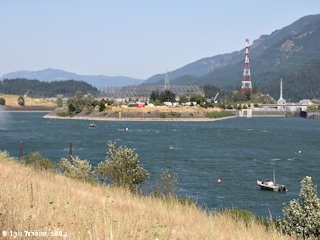 Robins Island is on the left and the Oregon side of the Columbia River is on the right. Image taken June 29, 2005. Click image to enlarge Robins Island (left) and the western end of the Bonneville Locks. Image taken April 13, 2014. 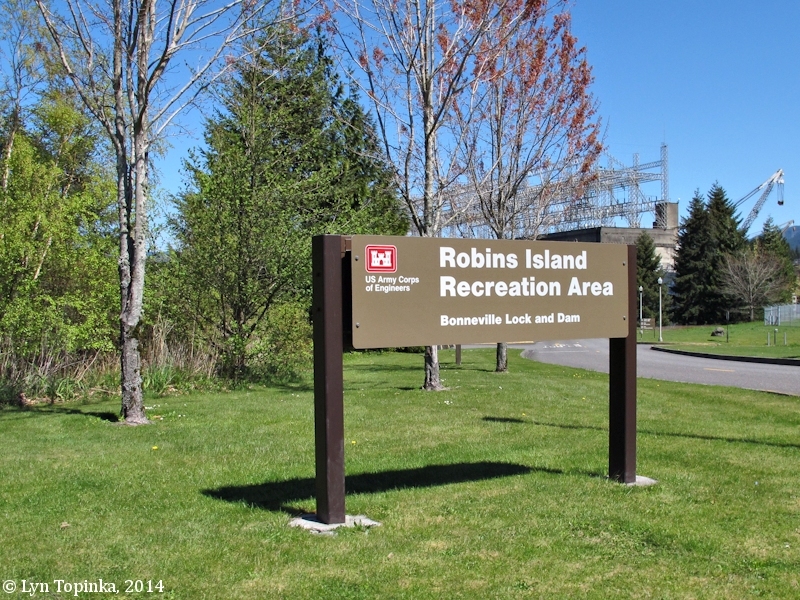 Click image to enlarge Sign, Robins Island Recreation Area, Bonneville Dam, Oregon. Image taken April 13, 2014. 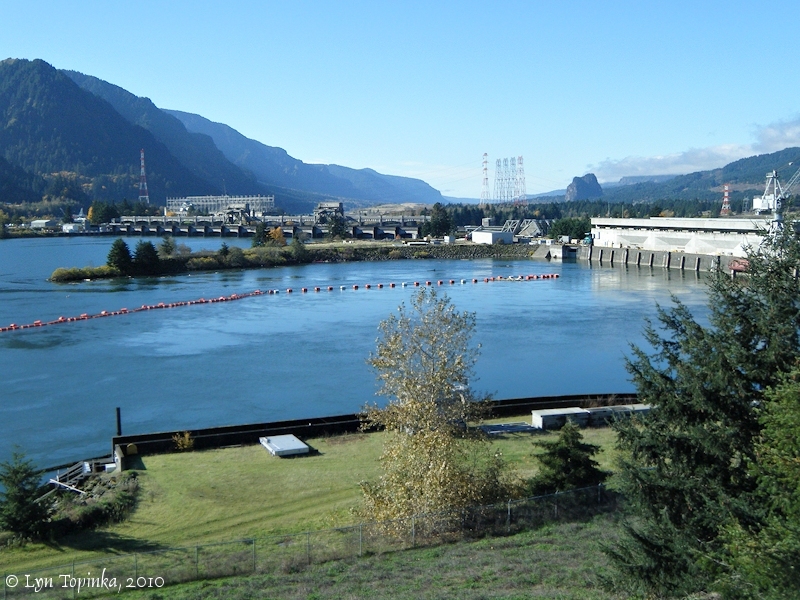 Cascade Island was built during constrution of the second powerhouse, now known as the "North Powerhouse". 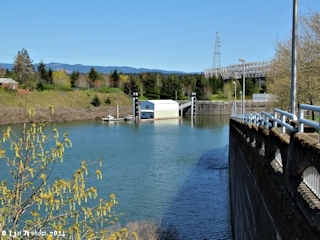 The North Powerhouse lies on Cascade Island north shore and the original Spillway Dam lies on the islands south shore. 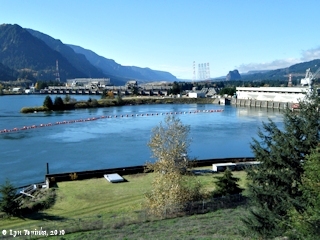 Click image to enlarge Bonneville Dam as seen from upstream, Washington side. View of the South Powerhouse (left), Spillway Dam (middle), Cascade Island (middle) and North Powerhouse (right). Image taken November 2, 2010. Bradford Island was named after two brothers, Daniel and Putnam Bradford, who were prominent settlers, merchants, and entrepeneurs in the area. They also owned a mill on their Donation Land Claim (DLC) near Ashes Lake. In 1856 during the Indian uprising the townfolks of Cascades took shelter in the Bradford's store. The skirmish was over upon the arrival of Lieutenant Phil Sheridan and Lieutenant-Colonel Steptoe and the troups. "... Daniel F. Bradford, and Putnam his brother, late in the fall of 1855, commenced the construction of a tramway between the Upper and Lower Cascades, five miles in length, which was well-nigh completed in the early spring of 1856. ..."
The 1860 Washington Territory cadastral survey map (tax survey) for T2N R7E, shows "Bradford's Railroad" which followed the Washington shoreline. It's eastern end was at the location of today's Ashes Lake (just upstream of "U.S. Garrison", known today as Fort Lugenbeel) and the western end was just upstream of the location of today's Fort Rains Fort Rains was not shown on map. The 1850 Federal Census for the Clark County, Oregon Territory (today parts of Clark County and Cowlitz County) listed a "D. Bradford, age 30, from New York", and a "P. Bradford, age 25, from New York", plus a soldier "Wm. S. Bradford, age 36, from New Hampshire. The 1860 Federal Census for Skamania County listed Danl. F. Bradford, age 42, occupation: "Merchant", from Massachusetts, Chloe Bradford, age 35, from Massachusetts, A.G. Bradford, age 36, occupation: "Merchant", from Massachusetts, B.F. Bradford, age 33, occupation: "Merchant", from Massachusetts, Hellen Bradford, age 25, from Illinois, and P.F. Bradford, age 4, from Oregon. There was also a listing for James Bradford, age 24, from New York, who was a Private at the "Garrison". The 1870 Federal Census for Skamania County listed no Bradfords. 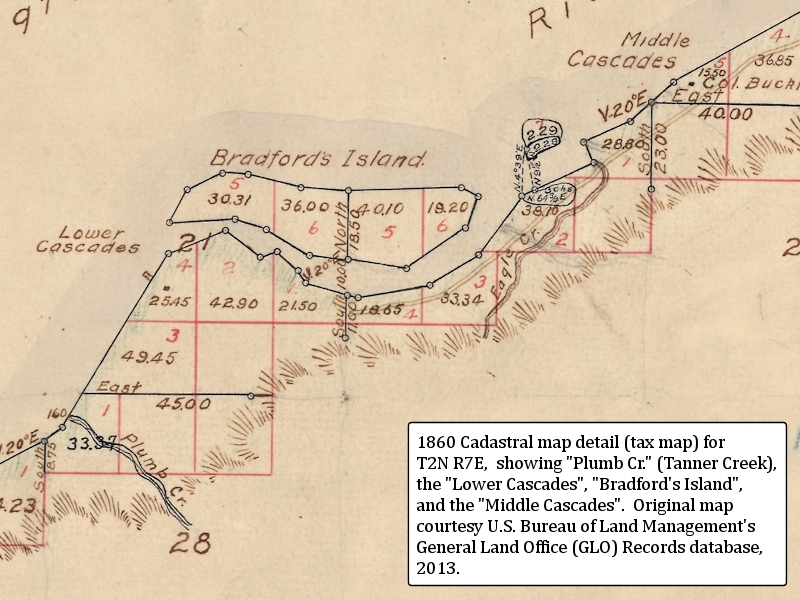 Bureau of Land Management Records show a Donation Land Claim (DLC) of 639.781 acres on February 5, 1862, for Daniel F. and Chloe H. Bradford, in T2N R7E, Skamania County.